The performance starts in almost complete darkness. As the lights start to grow, we see a collection of cables at the centre of the stage. The cables start to uncoil and move, like a nest of snakes slowly waking, as they are dragged off stage. We then notice a man in one of the corners, this is our main protagonist. He is somehow trapped in this space. It is a world he cannot control and he seems deeply troubled, like in a strange nightmare he cannot escape. This new work by two of Canada’s best known artists; choreographer Crystal Pite and playwright/performer Jonathon Young. They have created a performance that crosses the line between dance and theatre. Before the interval the performance is as much about the narrative as it is about dance, but after the interval it clearly nails its colours to the mast, with a strong emphasis on movement. The performance features a wide range of dance styles, with the narrative allowing these dark visions of other worlds. There is a drug infused cabaret style before the interval, with the dancers moving quickly between genres, performing tap dance complete with bowler hats, to flamboyant Brazilian salsa. The lighting and costumes of the characters make them seem other worldly, like a collection of ghouls visiting our troubled hero. The set for the first part of the performance is off centre, with one half of the stage an institutional space, with white walls and doors, while the other side is vacant, an empty space without light. The score created by Owen Belton, Alessandro Juliani, and Meg Roe is a haunting soundscape that adds to the vision. The actors talk directly to the audience, sometimes miming to the spoken words on the soundtrack. They move in time with the text, interpreting it through dance. There is a strong narrative to the piece but the performance fights hard to keep its secrets, only allowing the viewers glimpses, keeping them guessing throughout. We are told through a series of repeated phrases that the main character has gone through a trauma. There are mentions of addiction but again nothing is clear for the viewer. The trauma that is alluded to in the text is a personal tragedy, as Young’s 14-year-old daughter, along with two of her young cousins, died in a cabin fire in 2009. Young was at the scene of the tragedy and tried to enter the cabin but was too late to save the children. While it is not necessary to know the dark inspiration for this tale, it infuses the work and explains the mystery behind it. At the end of the night the dancers received one of the longest standing ovations I’ve seen, as the crowd seemed hugely impressed by what it had witnessed. 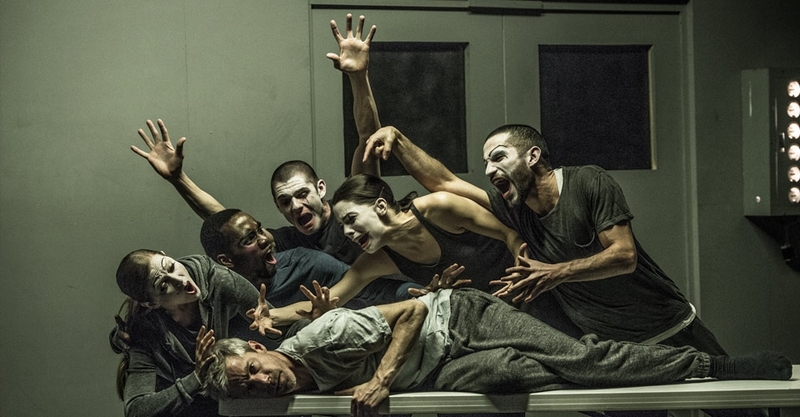 It is not the easiest piece, and draws its nightmarish images from all quarters, but it clearly illustrates that modern dance can deal with issues in ways that few other art forms can get to grips with, touching elements of the soul almost out of reach. Dublin Dance Festival continues until May 28th.